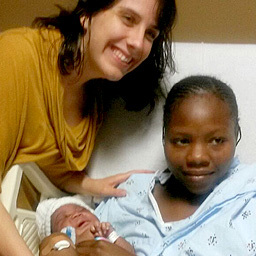 Courses for refugees that provide an overview of what they will encounter during their pregnancy, birth and postpartum experience in the United States. We train our labor support volunteers and then match them with expecting or new moms. They provide friendship and advocacy to individual refugee moms by attending 4 or more prenatal appointments and being available for the labor, birth, and postpartum period. Volunteers assist refugees in preparing for the arrival of their new baby. This could include things such as taking a mom to her prenatal appointments, helping secure baby supplies and providing emotional and relational support during this transition into motherhood. Want to sign up an expecting mother? Interested in volunteering? ​The first step is to attend the Friends of Refugees Volunteer Orientation and then our Volunteer Training. Weekly meetings where mother's and their children gather to talk about the joys and challenges of parenting. Please contact Jenny for location details. "Do I need medical training or experience in Pregnancy and Childbirth to volunteer?" No, we provide a one day training to teach our volunteers about pregnancy and childbirth. We do not provide any medical services, so no formal training or experience is necessary. "I want to help but I am not comfortable teaching a class." No problem! We also need volunteers to provide snacks and to help transport moms to and from classes. "Can I bring my children to the classes and Moms circle?" Yes, children are always welcome! Childcare is not provided during our 3 week class series, but we do having coloring sheets to keep them busy. We do talk about pregnancy, childbirth, breastfeeding and reproductive health, so please be mindful of how much exposure you want your child to have. Mom’s Circle is a less formal setting, and there are always kids to play with during that time.